Amongst the oldest of all cat breeds, Siamese is also one of the most popular. It is a short haired feline that is legendary for its beauty and intelligence. The cat hails from Siam, Thailand, where it is rumored to have kept royals company. It came to Britain in the late nineteenth century and enchanted the westerners with its sleek design and elegant looks. Siamese soon became quite popular across Europe. It appeared in United States in the early twentieth century. 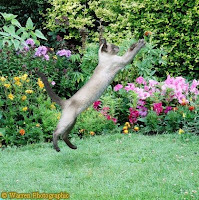 Initially the cats were seen predominantly in seal-point color but with passage of time blue, chocolate and lilac also gained acceptance as markings' colors. Today many other points' variations including red, cinnamon, cream, fawn, lynx and tortie occur even though they are not universally accepted. Also the body structure varies, with the modern 'show class' Siamese being a more finely built animal than the 'traditional' Siamese which is robust and muscular. Siamese is a cat that defines elegance. Its long tubular body with its graceful legs and thin tapering tail is a sight to behold. Coat is white to cream in color with markings occurring on ears, feet, tail and snout. It is short and close-lying and accentuates the fine lines of the svelte feline. Kittens at birth lack markings and develop them in infancy. As the cats age their fur generally tends to get darker. Head is wedge shaped with large widely set ears and almond shaped bright blue eyes. Overall appearance of the Siamese is that of the classical finely built Oriental cat, that is made remarkable by its impressive points. Owing to its widespread appeal and sought after personality, over the years breeders have used Siamese in creation of many new cats. 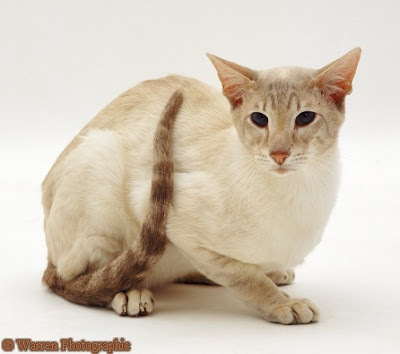 These include Balinese, Burmese, Colorpoint Shorthair, Himalayan, Javanese, Ocicat, Orientals, Snowshoe and Tonkinese. Siamese and its descendants are seen in nearly every corner of the world today and are quite popular in culture and media globally. Siamese are famous for their bright personalities and inquisitive nature. They are totally people oriented and some consider this to be an evolutionary adaptation by the smart cats since they can't hunt and operate as well at night owing to lack of the retinal reflective membrane that allows most predators to see in dark. Thus they have learned to train people to look after them. 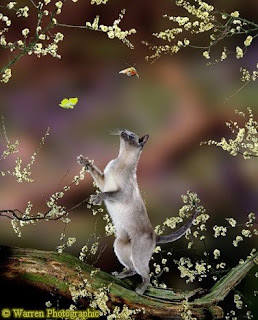 Siamese are among the most vocal of all cats and regularly communicate with their humans through their meezer voice. On the whole Siamese are affectionate and brilliant individuals who are cherished around the world as the true aristocrats of cat breeds. awww i love siamese. My cat C.J. wwas a siamese cat. He was always a undle of joy but he went to rainbow bridge not to long ago. But no matter what he will always be in my heart. most favorite of all cats. Cats can be such a wonderful friend. I am 58 and it has been awhile since my hubby and I had a cat. we got her at a cat adoption house. We both love her and she returns that love, Thank God for such a great pet. My Samuel died Febuary 17th of this year, he would have been 11 years old this April 18th. Sam was a lilac/snow shoe Siamese. He was our constant sleeping buddy until my husband passed away in 09; then, my sleeping buddy. I will miss his soft fur on my skin and his wonderful gentle ways. I've had many cats in my 68 years but Samuel wasn't my first siamese but he was most loved. They all were. The best cat I ever had the pleasure of sharing my home with was a Siamese.She was very vocal and she owned the house. She enjoyed going outside as I had over 20acres and she would explore a little everyday.